Thanks for all the reply’s as soon as I placed the order it was cancelled 😞. Does anyone know if the imported codes will work on us account or will I have to make a new account and game share ? My CE shipped yesterday and will be here tonight. I know there's plenty of unboxings but I'll post thoughts later. Just realized the NA diorama doesn't play music which is a bummer but still likely cancelling my King's Edition. I did end up cancelling the King's Edition. In the end, I did prefer the box and overall design of the art book, but that was about it for my preferences. I don't know that I'd call the little music diorama "better" than that large diorama with the multiple figures, but I do know that both have an equivalent chance of me displaying them (zero). So, I went with the art book with more art, the better (IMO) steelbook, and the CD in place of the vinyl which I would not use. It was still a close call. Plus, at these prices I'm not going to tolerate it arriving damaged and it will be easier to deal with the U.S. version than the EU version. Then again, I can see it being hard to get a U.S. version without outer damage to the box given that packaging. The King's Edition box looks to be of higher quality than the U.S. one.... although, I have seen an unboxing where it arrived damaged and that damage impacted the art book as well. My Ni No Kuni 2 Kings Edition from the UK and CE from BB shipped yesterday. Probably won’t get the Kings Edition till the end of next week but CE will be here tomorrow. The Kings Edition is available for order on Amazon UK if they want it. I just cancelled mine and found they were preparing it. Hopefully the cancellation goes through. Their batting average is pretty great I think but I've received damaged steelbooks from time to time. Ni no Kuni 1 had such a rare CE, it's weird that 2 is so readily available. Debating returning mine now too. Ni No Kuni was released at the end of the PS3s lifespan and it was a new franchise at the time so I imagine they didn't produce nearly as many CEs. Includes all in-game rewards contained in the Digital Collector’s Edition and Pre-Order Bonus “Queen’s Bounty” pack, as well as the Nightmare Senche mount. Includes access to the full The Elder Scrolls Online base game, with adventures across all of Tamriel. 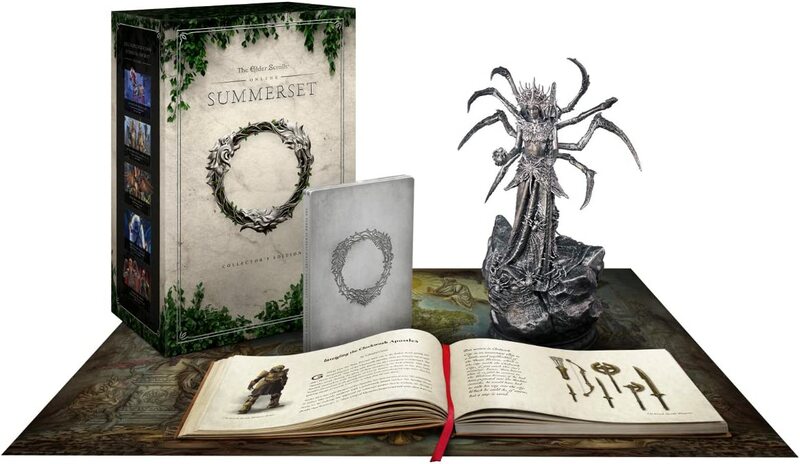 I would expect a disc with the base game and DLC code for the Summerset expansion. Ordered a Summerset CE from Best Buy for the XBone. That's why I cancelled mine and am hoping it goes on sale like 50% off later. Willing to wait this one out. I wouldn't play it right now anyways as I have so many backlogged games I am slowly working my way through. It would be awesome if Amazon had the same type of screw-up in price that they did with the Morrowind CE, but I think that ship has long since sailed. You can also use 100 uPlay points to get 20% off. Brings it down to $51. Been looking forward to NNK2 forever but I’ve fallen on hard times and now that it’s releasing I can’t afford even one of the CEs (had the Kong’s and Collector’s preordered). $172.11 USD was the final price charged me my credit card for the Ni no Kuni 2 CE from Amazon UK. My card was charged $157. Is Watch Dogs 2 Gold Edition even worth getting? I platted the main game and have been watching the PS Store for a sale. It's got a pretty laughable interpretation of hacker culture but does a decent parody of Silicon Valley VC and tech culture. It's absolutely amazing as a game where you don't kill people but actually have decent tools to play that way (better than Deus Ex, Dishonored, etc.) and has decent trophy list where the tedious crap isn't necessary for the plat. There's a few MP trophies that could be harder to get but I imagine even with a few players matchmaking could make it work. DLC has received decent reviews. I was charged $154.40 just now.